The schools designed to teach children incarcerated in the Los Angeles County juvenile justice system may be seriously underserving students, according to a new report by the Children’s Planning Council (CPC). As a result, Supervisor Don Knabe today called for a top-to-bottom reform of the education system in the County’s juvenile halls and probation camps, including the possible use of charter schools. According to the CPC, recent student performance data show that most of the youth in the juvenile justice system have been – and continue to be – left behind despite ongoing research that shows that education is one of the areas most in need of improvement in the system. – In 2004, 74 percent of juvenile justice students did not pass the California High School Exit Examination. – 20 percent of all Probation students require special education programs; double that of the general school special education population. – School attendance records for Nidorf Juvenile Hall reveal that on one particular day in April 2007, 14% of students in the hall were not enrolled in the on-site school and only 78% of the enrolled students attended that day. – Students in some high-risk units received little more than one hour of instruction on a particular day. 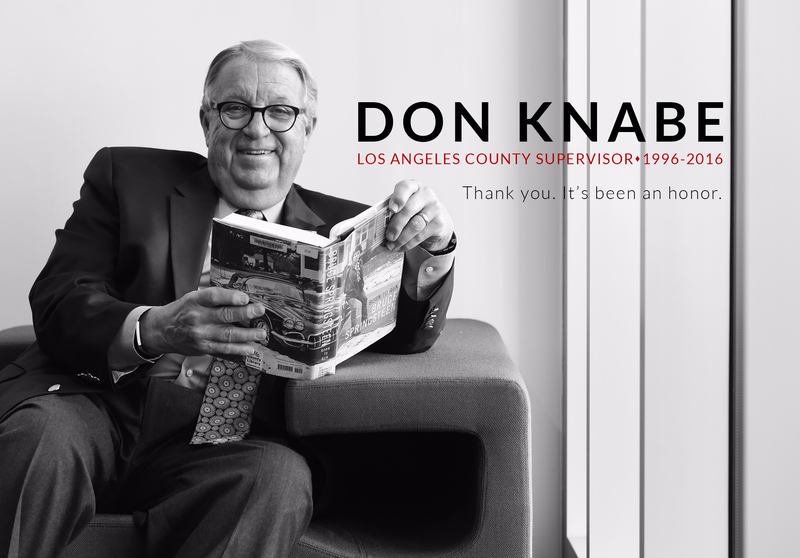 Knabe’s call for reform directs County agencies to develop a comprehensive plan to dramatically reform education programs in the County’s juvenile halls and probation camps, including an exploration of the feasibility of charter schools and other innovative models of education. We have nearly 3,000 children enrolled in our probation schools and we have an obligation to provide each and everyone one of them with access to educational opportunities, said Knabe. If we want to keep these kids from returning to the juvenile justice system or from ending up in County jails later in life, then access to quality schooling must be a critical component of how we are serving children in our camps and halls. Supervisor Don Knabe joined over three dozen arts education groups who were grant recipients of the 2007 Knabe Arts Education Partnership Program for a reception at the Long Beach Art Museum. Any 4th District school or non-profit organization that plans to offer a program relating to arts youth education was eligible to apply. The organizations must also currently work in the 4th District. The funding for the Arts Education Partnership Program comes directly from Supervisor Knabe’s discretionary account for funding local projects within the 4th District. Review and selection of programs that received funding was completed by a panel of experts and professionals from various arts disciplines and backgrounds from the 4th District. From my youth, the arts have been a personal passion of mine. Children with opportunities in arts education have a lifelong benefit. The arts enrich the lives of so many people and add to a vibrant community, said Supervisor Knabe. I am confident that this year’s grant recipients will continue our mission of providing quality arts programs for our residents. Los Angeles County, through its Arts Commission, has given grants totaling $530,000 to 90 performing, literary, media and municipal arts organizations throughout the County to support paid internships for college undergraduates in summer 2007, Supervisor Don Knabe announced today. Descriptions of and contacts for the 130 internship positions are posted on the Arts Commission’s web site. Go to www.lacountyarts.org, click on Internships, then 2007 Internship Database. Click here for the direct link. The positions are searchable by region, arts discipline, professional field and keyword. General information on the internship program is also available on the web site. Organizations in the Fourth Supervisorial District offering arts internships include the following: the City of Manhattan Beach, the City of Torrance, International City Theatre, Long Beach Symphony Association and Public Corporation for the Arts/Arts Council for Long Beach. Interested undergraduates should apply directly to the organization offering the internship, not the Arts Commission. College undergraduates either resident in or attending school in Los Angeles County are eligible for the internships. Interns are paid $350 per week for ten weeks and take part in educational and arts networking activities. Through the program, interns gain a deeper understanding of the work involved in nonprofit arts administration and the role of the arts in a community, and develop business skills that can be put to use in their future careers. Internship host organizations help mold and shape potential new workers in the arts field who may go on to arts leadership positions on staffs, boards or as volunteers. – A production and education intern to work at the Long Beach Symphony Orchestra to assist with the preparation and planning for the 2007-2008 season including concert production, artist relations and education programs. – An associate producer intern to work at the City of Torrance to join the producer and work on all aspects of production including publicity/marketing, administrative, community relations, sets, props, and related responsibilities. The intern’s primary focus will be on the summer musical (West Side Story). – An arts learning department Intern to work at the Public Corporation for the Arts (Arts Council for Long Beach) to develop a completed student workbook and teacher’s manual for the department’s public art education program. Additionally, the intern will be exposed to other essential responsibilities of the Arts Learning department by serving as an associate to the department’s director. Five talent groups from the Fourth District will perform in the 47th Annual L.A. County Holiday Celebration, a performance that is a gift to the community from Supervisor Don Knabe and the Los Angeles County Board of Supervisors. The free performance is at the Dorothy Chandler Pavilion on Friday, December 24 from 3:00-9:00 p.m. Inspirational Voices of Free! of San Pedro, Albert McNeil Jubilee Singers of Hermosa Beach, Golden State Pops Orchestra and Sheridan Singers of San Pedro, Grupo Folklorico Sabor de Mexico from Torrance and Khmer Arts Academy from Long Beach will be among 1,500 performers in choirs, music ensembles, and dance companies. "This is such a wonderful opportunity for the public to see the talent that exists in our community," said Supervisor Knabe. "It is fantastic to see how everyone comes together to celebrate the spirit of the holiday season." www.holidaycelebration.org or by calling 213-972-3099. The web site includes a complete program listing with selections to be performed by each group. Doors open at 2:30 p.m. Patrons may come and go throughout the six-hour performance. Free parking is provided under the Music Center. Reservations for tickets to the show or parking are not necessary. Those who cannot attend the show in person can watch the live broadcast on KCET, Channel 28. A state-of-the-art lifeguard and paramedic headquarters building will soon be built in the city of Avalon. Construction moved one step closer to reality today when the Los Angeles County Board of Supervisors voted to accept a donated piece of land by the City of Avalon for the building to be constructed on. The Avalon Lifeguard facility will also have one unique feature among all of the County’s similar buildings. This will be the first to include dormitory space for workers. County lifeguards are on-call for 24-hour periods, meaning that anyone stationed in Avalon would need to secure to housing in the City’s small and expensive housing market. With the new building, workers will be able to complete their shifts with out having to acquire housing off-site. The structure will include administrative offices, staff housing and equipment storage. Construction will begin later this year, and the station is expected to be ready no sooner than September 2007. Supervisor Don Knabe is pleased to announce grants to 26 arts organizations from the 4th District. The Los Angeles County Arts Commission Organizational Grant Program (OGP) grants were awarded competitively and reviewed and scored by panels. The grants for the 4th District are part of awards totaling $4,518,000 to over 250 nonprofit arts organizations countywide for the fiscal year 2006-07 to create visual and performing arts projects, strengthen infrastructure, and provide access to the arts for children and adults. The total allocation doubled the $2,259,000 from 2005-06. This appropriation makes the Los Angeles County Arts Commission the largest public funder of the arts in Los Angeles County. Our entire community will benefit from this increase, but I am particularly pleased with the impact it will have on young people, said Supervisor Knabe. From my youth, the arts have been a personal passion of mine. Children with opportunities in the arts have a lifelong benefit. Grant recipients based in or providing most of their services to the 4th District are listed below. A double asterisk next to the organization name indicates a first-time grantee. **A double asterisk next to the organization name indicates a first-time grantee. Supervisor Don Knabe today was pleased to announce that the Los Angeles Philharmonic will be performing in the Fourth District at Rolling Hills Covenant Church on Wednesday, May 24 at 8:00 PM. This free concert will be the first of four Neighborhood Concerts that are part of the Los Angeles Philharmonic’s Target Around Town concert series. The conductor of the Rolling Hills concert will be Lisbon native, Joana Carneiro. Carneiro’s program for the evening will include Mussorgsky’s Night on Bald Mountain, Liadov’s Baba-Yaga, The Enchanted Lake, and Kikimora, and Stravinsky’s The Firebird. I am thrilled that the Los Angeles Philharmonic is once again making a stop in the Fourth District, said Supervisor Knabe. This is a unique opportunity to see the LA Phil perform outside of downtown, and I encourage our residents to attend this free concert. Tickets for the Rolling Hills Covenant Church performance are free with a limit of six tickets per request, and the tickets may be picked up at the main church office. For more information, please call (310) 521-2514. Rolling Hills Covenant Church is located at 2222 Palos Verdes Drive North in the City of Rolling Hills Estates.